Ricotta means â€˜recookedâ€™ in Italian, and is traditionally made from the whey that is leftover from other cheese making. 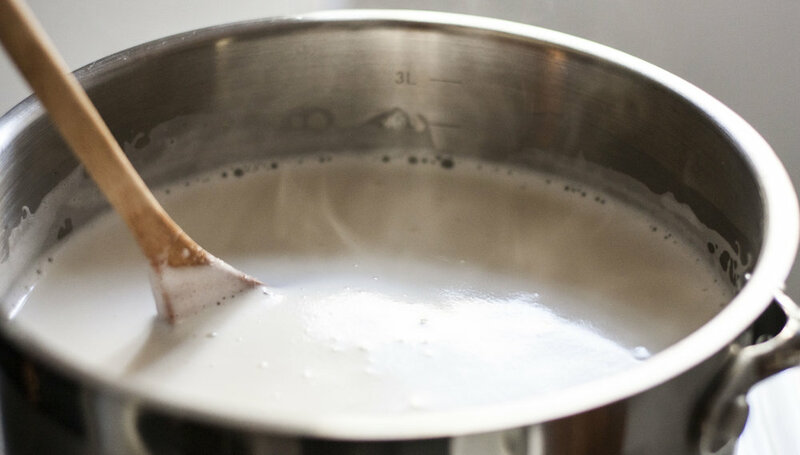 Warm the milk in a large saucepan on the stove. Stir the whole time to avoid it catching on the bottom of the pan. Just before boiling (when the milk starts to steam and froth a little) remove from the heat. (If you have a thermometer this will be when the milk is around 94oC / 200oF). Immediately add the lemon juice and gently stir for 3 seconds. Youâ€™ll start to see the milk break into chunky curds and watery whey. Let it sit for 10 minutes. Set up some cheesecloth* over a sieve over a large bowl. Using a slatted spoon, gently lift the larger chunks of curd into the cheesecloth. Now carefully pour the remaining mixture into the cheesecloth (try to avoid pouring it from a height so as not to break the curds up too much). Allow the ricotta to drain anywhere from 10 minutes to an hour, depending on your desired texture. Ricotta is now ready for eating. It will keep for a few days in the fridge. Whey is a great source of protein. Add to smoothies or use on muesli. If you canâ€™t find cheesecloth, a clean tea towel or Chux cloth will do. Lemon juice can be substituted for same measure of white vinegar or Â½ teaspoon of citric acid dissolved in water. Donâ€™t use UHT (ultra pasteurized) milk, it wonâ€™t work. Use fresh, full-fat milk.